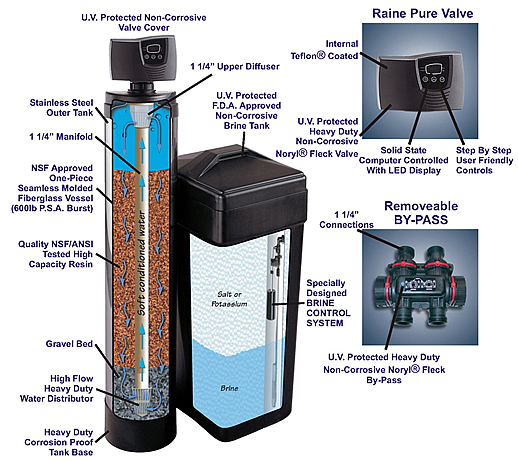 Whole house water softener system, the Premier HF 7000 valve manufactured by Pentair is NSF 44 certified. It can flow up to 35 GPM. The Premier control valve can be utilized in both 1.0" and 1.25" configurations and this systems features a maximum resin capacity of 60,000 grains. Eliminates micro switch failures and by using specialized weather coatings, each system's electrical circuitry is 100% environmentally protected from moisture and corrosion. Engineered and tested to withstand the equivalent of 27 years of uninterrupted daily use. Premier series of conditioners the most efficient water systems today.